The pairs event at the Grand Prix Final was a great finish to the GP season. The whole event was skated at a very high level, with many season’s best performances to enjoy. Duhamel/Radford won the Final with a convincing, and perhaps slightly unexpected, victory. Although D/R had won both their GP events, many saw Stolbova/Klimov as the favorites going into the Final. For Stolbova/Klimov, this loss comes as a bit of a surprise, and we’ll have to see how it affects their strategy for the rest of the season. The Chinese pairs once again had a very strong showing at this event. They are clearly “the best of the rest” at this point and well positioned to win a medal at their home Worlds in Shanghai. Let’s look at how the pairs did. Was this Meagan/Eric’s best competition ever? If not, it must be very close to it. They really skated amazingly well in Barcelona, and they must be thrilled right now. I’m sure it was especially satisfying coming after Eric’s announcement about his orientation last week. Eric had worried that coming out during the Olympics might be too much and overshadow their skating. However, such was not the case in Barcelona. At the GP Final, Meagan & Eric’s skating truly spoke for itself. Any discussion of his announcement was quite separate—as it should be. Duhamel/Radford began the competition with another excellent short program. Their Un Peu Plus Haut SP has been so successful for them all season, and it was here, too. They skated the program full out, holding nothing back. Their energy and confidence were really impressive. The SBS 3Lz was again terrific and earned 6.90 points. And their twist got a level 3 (both here and in the LP), which was one level higher than they’ve had so far this season. They received a season-best score of 74.50. Their long program also went extremely well. Meagan/Eric are often a bit tight in the long program and tend to make errors. However, they broke that trend here with a really solid performance in the free skate. They opened with a good triple twist, followed by the SBS 3Lz. Meagan had a slight hand down, but the jumps were landed. Then they hit the throw 4S! This is such an exciting element to see. And I’m really impressed with how quickly they’ve gotten this jump into their repertoire. This was their fourth attempt at the quad throw this season, and 3 out of 4 attempts have either been landed or very close. Wow. They earned 8.71 points for the quad throw (the highest score in the event for a throw jump). They kept up the performance level for the rest of the program, too. They landed their SBS 3T/2T/2T combo (although not with much runout) and had great ice coverage on all the lifts. They ended with an LP score of 146.22, the best LP score this season for pairs. It was a great victory for Duhamel/Radford. I’m not a huge fan of their Muse LP; the overall package lacks sophistication and is a very stereotypical “athletic North American pairs” type of program. However, the program clearly suits D/R and is working for them. With this victory, Duhamel/Radford have now positioned themselves for a possible gold medal at Worlds later this year. They have the difficulty, and they proved that they can hit it w hen it counts. If Meagan/Eric continue to skate at this level, they will be not easy to beat. Do they need a new strategy? This competition had to be a major disappointment for Stolbova/Klimov. They were no doubt looking to dominate here and establish themselves as the clear favorites for Worlds. Their GP results had suggested such an outcome was very much in reach. Instead, they lost to D/R by 7 points and were second in both segments–despite skating almost entirely clean programs. What went wrong? Basically, their strategy failed. Stolbova/Klimov entered this event at a clear disadvantage in base value to D/R. So far this season, D/R’s total base value per competition had been 8.35 points higher, on average. Stolbova/Klimov’s strategy was to overcome that disadvantage by getting great GOE/PCS and assume that D/R would make mistakes and not get their full base value. Instead, Duhamel/Radford increased their base value advantage to 9.5 points here and performed their programs very well. Stolbova/Klimov got their usual big bump in GOE for great execution (20+ points total) and great PCS. However, D/R were able to stay close enough in GOE (18+ points total) to negate S/K’s usual GOE advantage, and were right there in PCS, too. So D/R’s BV advantage of 9.5 points held up for the win. Stolbova/Klimov actually skated very well here. Their short program was very clean. Ksenia had great runout on the throw 3Lz, and their step sequence was crisp and sharp. It was a fine program and earned a season’s best score of 72.33. However, they stood in second place after the SP. They looked a bit tense at the start of their Notre Dame LP. The triple twist was just slightly crashy, (although they still got positive GOE). Ksenia then singled the second 2T in their SBS 3T/2T/2T, which cost them at least 1 point. The throw 3S at the very end of the program was a huge highlight, as always. They intrepreted the program strongly, but the hoarse, loud Spanish vocals were hard on the ears and distracted from the performance. They ended with a score of 141.39, about 1.5 points off their season’s best at Rostelecom. They looked a bit stunned in the kiss-n-cry. I think there’s an argument that S/K should have had higher PCS here than D/R. Just in terms of skating skills, speed, and quality, Stolbova/Klimov are easily the best pair in the field. Their interpretive ability and use of their whole bodies for expression is also tops. However, I think there are two reasons their PCS scores weren’t higher. First, when you skate as cleanly and with as much energy as D/R did, the PCS tends to follow, even if the absolute quality level isn’t quite the same. Second, I feel Stolbova/Klimov’s programs are holding them back this year artistically. The short program is fine, but too mechanical. There aren’t enough highlights; not enough wow factor. The Notre Dame LP has more highlights, and they really sell it. However, I don’t think it suits their strengths. For example, the program has spot where they stop or slow down for headgrabbing “dramatic” movements. This distracts from their speed, which is their best asset. Stolbova/Klimov decided to go into this season using basically the status quo. Same elements as last year, almost the same short program as last year, same layout as last year. They haven’t really moved forward, whereas D/R has. It will be interesting to see how they respond going forward and if they change their strategy. Sui/Han did not skate quite as well here as at Trophee Eric Bompard. However, they were still able to win the bronze medal. They started with a good performance of their Stray Cat Strut SP. Their throw 3F was excellent and had great height. They earned 7.20 points, making it the highest-scoring throw jump in the SP. Their level 4 Tano triple twist was also extremely impressive and was the highest-scoring twist in this segment. The only mistake was a hand down from Sui on the SBS 3T. They delivered the program very nicely, although not with quite the same energy as at TEB. They earned 66.66 points and placed third in the SP. Sui & Han opened the long program with a terrific quad twist. However, Sui then completely missed the SBS 3T/2T/2T combo, and they earned almost no points for the element. The following lift also looked quite shaky. They regrouped and hit the throw 3F, although the landing was a bit forward. The program got better from that point on, and all their other elements were good. They kept the speed and attack up well. However, it was definitely not their best outing with this program. They were a little tight and mechanical throughout; a little bit lacking in expression. Perhaps the pressure of being in the final group got to them. They dropped to fifth in the LP, but the scores were close enough that they held on for bronze overall. This event was a mixed bag for Peng/Zhang. The short program was disappointing, but they recovered with a good performance in the long program. They started their Arabian Dance SP with another fall from Peng on the SBS 3T. It’s really unfortunate that the fall marred this otherwise lovely program. A highlight was their gorgeous throw 3Lp, which was smooth and beautifully landed. This element earned all +2s and +3s. Their triple twist was also excellent. The program is so interesting and beautiful, and I thought they performed it very well here, except for the fall. However, they were in 5th place after the short. Their Shostakovich LP was better. They opened the program with an incredibly high quad twist, which was the highest-scoring element in the entire pairs event (9.96 points). Their throw jumps were both beautifully done and received high GOE. They had the highest-scoring lift in the event (8.30 points for the second lift). They did land the SBS 3T/2T (yay! ), although Peng singled the SBS 2A. They skated with good speed and unison, and Peng had some beautiful positions in the lifts and spins. I absolutely love this program for them. The music is so compelling and ominous; the choreography so precise and detailed; I just love the whole package. They scored 129.33 (improving on their previous best by almost 5 points), and pulled up to third in this segment and fourth overall. However, Peng did not look happy afterward. I’m certain they were hoping for bronze or better at this event, so overall it was a bit disappointing. Plus they lost to Sui/Han, their domestic rivals. Next up is Chinese Nationals. Making the Chinese World team should not be a problem. However, if they want to win and beat Sui/Han, Cheng Peng will need to find a way to land those SBS jumps. How fast will they rise? I think Yu/Jin really impressed many at this event, despite placing only 5th. This is a young team most definitely on the rise. They had a very good performance in the short program. Their SBS 3Ts were great, as usual. Their triple twist was also excellent, earning almost all +2s. They also landed a very nice throw 3Lp, with great height and ice coverage. I thought this was their best short program so far this season, and they earned a season’s best 62.71. Their Humility & Love LP looked much improved already from NHK. Their chemistry, connection, and performance level in this program are all getting steadily stronger. The program is sort of mesmerizing and mysterious; quite different from any other program this year, and fascinating to watch. Technically, it was not their best performance: Xiaoyu landed a bit forward on the throw 3Lp and put her hands down on the throw 3F. Also, their SBS spins were not quite in synch. However, they did successfully land a gorgeous level 4 triple twist, a SBS 2A/2A sequence, and the SBS 3T. Yu/Jin scored 125.08 with their long program, several points above their previous best, but placed 6th in this segment and 5th overall. Nevertheless, I think this team still made a big impression in their first–but surely not last–appearance at the Grand Prix Final. Their short program was rather disastrous. Yuko fell on both the SBS 3T and and throw 3Lp. Skating after the three Chinese teams, their triple twist really suffered in comparison, with not much height, a crashy landing, and negative GOE. The entrance to their death spiral was shaky, and the SBS spins slowed down at the end. They did have a nice lift. However, altogether they earned only 55.97 to place 6th in the SP. They had a better performance in the long program. Yuko stayed vertical on the SBS 3T/3T sequence, SBS 2A, and throw 3Lp. She also landed the throw 4S, albeit with a hand down, but still exciting to see. However, the SBS spins caused problems—they were quite out of synch, and Yuko lost speed at the end. And the triple twist again was weak and received all negative GOE. Technically, the best elements were their lifts. They scored 128.57 and managed to pull up to fourth in the long program, but it was still far below their season’s best from Skate America. Their Manfred Symphony LP is so beautiful and dramatic, but right now they’re just making way too many mistakes. They need to execute the program much more cleanly to be competitive at the big events. Their next event is Russian Nationals. They will need to skate strongly there to hold off the younger teams Tarasova/Morozov and Astakhova/Rogonov. Last week saw the final senior B competition of the season, Golden Spin of Zagreb. New teams Astakhova/Rogonov and Marchei/Hotarek captured the gold and silver medals. Tarah Kayne/Danny O’Shea of the U.S. won the bronze medal in Tarah’s return to competition after undergoing hip labrum surgery this summer. U.S. pairs fans were happy to see Kayne/O’Shea get a medal; however, the fact that they lost to 2 brand-new teams who have been together less than a year gives me some pause. Kayne/O’Shea do have another month to train until U.S. Nationals, and I look forward to seeing them there. Finally, Julianne Seguin & Charlie Bilodeau won the Junior Grand Prix Final in convincing fashion, after dominating the junior GP circuit this season. This pair is also in the mix for the Canadian 4CC/World team; they are age-eligible for Worlds, despite competing as juniors internationally this season. Canadian Nationals will be a very interesting pairs event. 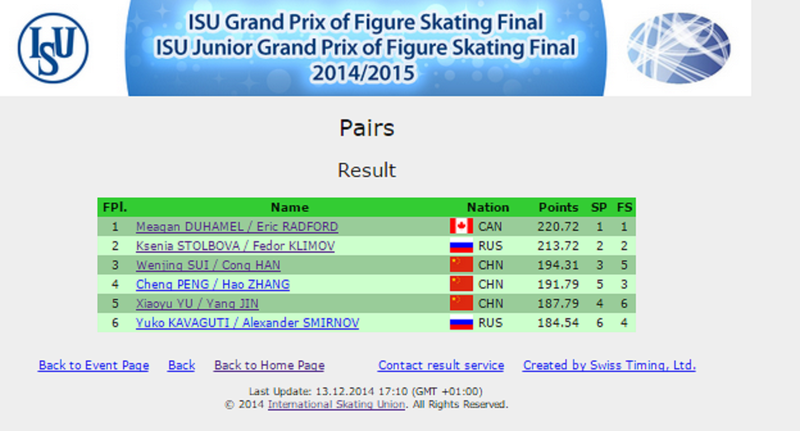 It was great to see such a strong pairs event at the GPF. The level of execution and performance is increasing as the top teams build toward the second half of the season. Once again, I was particularly impressed with the Chinese pairs as a group. The top medals went to Stolbova/Klimov and Duhamel/Radford, and that may happen at Worlds too. But in this transitional year, it’s the Chinese who are really bringing the excitement for me. Their technical proficiency is just so impressive, so satisfying to watch. Aside from occasional problems on the SBS jumps, they perform all their other elements with such quality and consistency. Their triple and quad twists are textbook; almost perfectly done. They hardly ever miss on the throw jumps. And, as I said a couple weeks ago, they just don’t make silly mistakes on death spirals or footwork. Even more exciting is the artistic development of the Chinese teams. Each of the Chinese pairs has such interesting programs this year. They’re trying different things, choosing unusual music. They’re not doing the same-old/same-old. And all four teams have different, unique personas on the ice. I love it! I think this year is all about D/R and S/K. But might next year–and the years after that–be all about the Chinese? We’ll see.